Our kitchen is pretty cozy but it is bigger and much more functional than the last one. 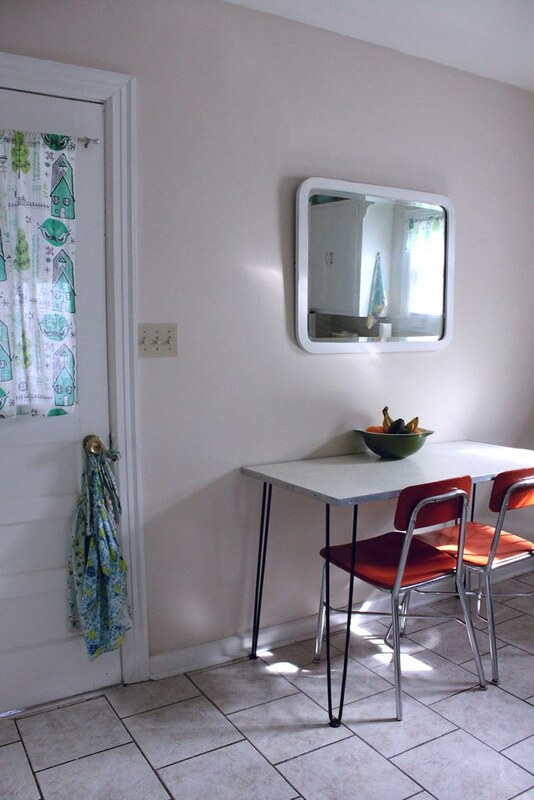 There is room for a breakfast table, it's got great light in the morning, and the original cabinets are at least white. It's so much happier in white. That's the old back door of the house. It currently leads into my studio and down to the basement. I love that it has a glass pane so Brett can look in on things but Ruby can't see me if it's studio time. Out of sight, out of mind! I added the old curtain from our last back door to bring in more color and to hide the mess. It's usually a mess as there are always at least a few projects in process. More on that space later. 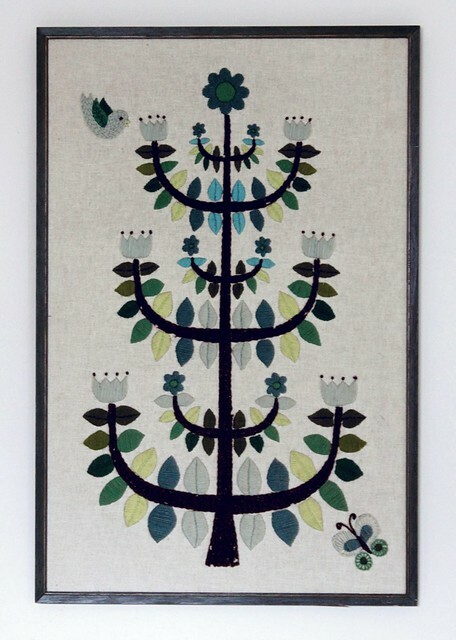 I've loved this piece since I saw it on Dottie Angel's blog a few years ago. I used to have this one and Elsie had the one above. She saw mine and loved it and I told her it was great but the one I really loved (this one) was at Funtiques (local shop). She had just recently picked up the same one at a flea market so we traded! These are the colors I see myself moving towards in everything I do so it was just a better fit in our home. The hairpin table was found at my favorite warehouse in southwestern Missouri. I'm not divulging the name and location of this place because it's absolutely my and my MIL's favorite little secret. I know, that's mean. I saw this table but didn't pick it up right away as I wasn't sure it would fit in our small kitchen but I couldn't stop thinking about it. 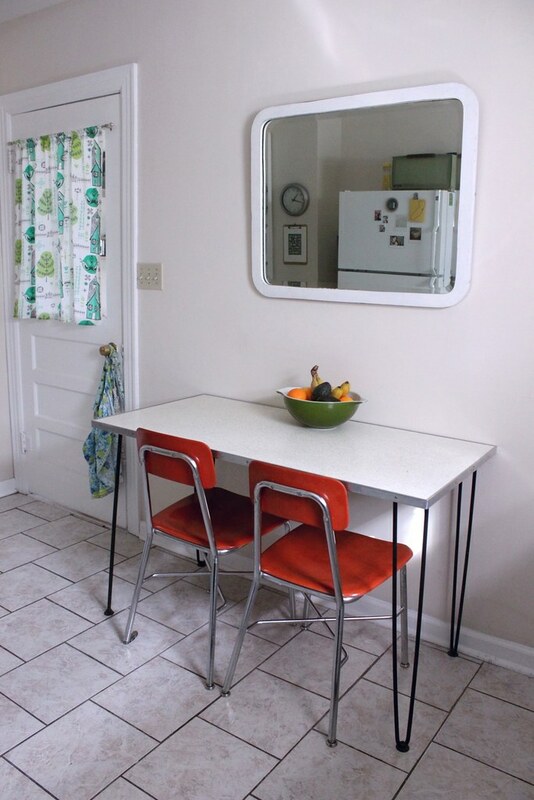 Once I found those vintage school chairs I knew they'd make a lovely set and had my MIL go snag the table. Thankfully, it was still there (and only $15.00). The white mirror was found at a vintage shop in Ballard, a lovely neighborhood/town in the greater Seattle area. If ever we were to move back I'd want to live in Ballard. It's beautiful and quirky and full of happy shops and interesting people. Anyway, the mirror is super heavy but one of my favorites because of it's simple design. The aprons on the door are vintage with an Anthro one thrown in from about six years ago. They are all green/blue/yellow/cream and lovely. The curtain is made from a bedspread from Urban Outfitters that I had to hunt down three years ago. It's one of my favorite prints. We haven't had a built in dishwasher in most of our dwellings but with two kids and working from home, we knew doing them by hand would only equal piles of dishes all of the time. We purchased a counter top dishwasher around Christmas but it's about an inch taller than the space between the counters and cabinets so we've had to make do with it on a solid old end table that we scoot to the sink and back almost every day. It's ugly and annoying but we're willing to put up with it for now. Oh, how I look forward to the day when we can have a built in! There used to be doors on the open shelving at the very top. 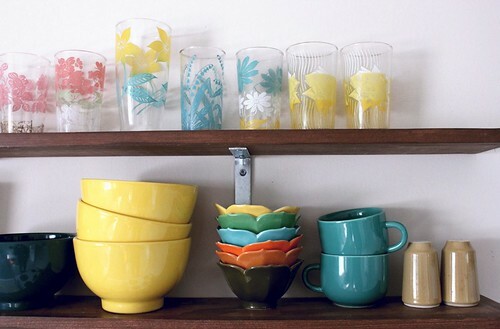 I decided it was a great place to store some Pyrex and other vintage pieces that I love but don't use every day. It adds a lot of happy to our space. Speaking of happy, the mug shown above is one of my favorites that was gifted to me by an online friend. I've never come across one like it! The glasses and dishware below have been collected over the last four years. I am still on the hunt for pretty floral glasses and an Alpine Swiss plate set but I'm thankful to have stumbled across so many beauties locally. 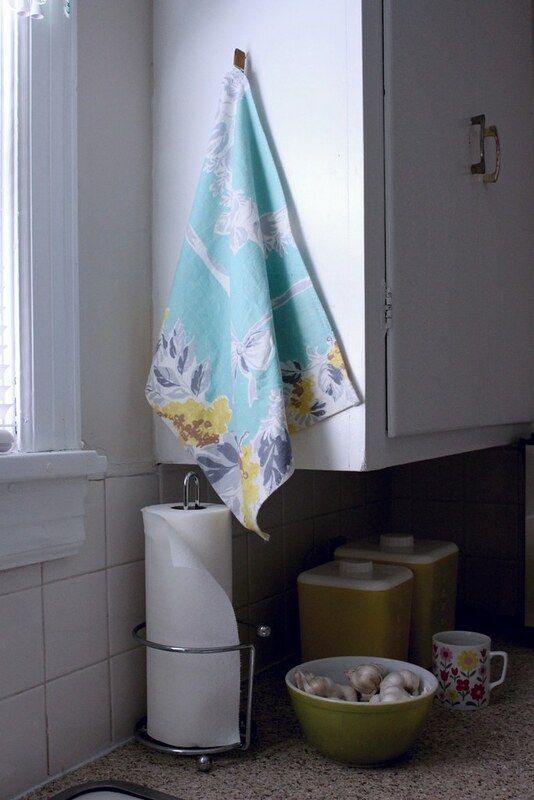 The dish towel below was cut from a vintage tablecloth that had some ugly stains on it in three different places. I was able to get two dish towel sizes out of it after cutting them down, hemming the edges, and adding a hang tab. 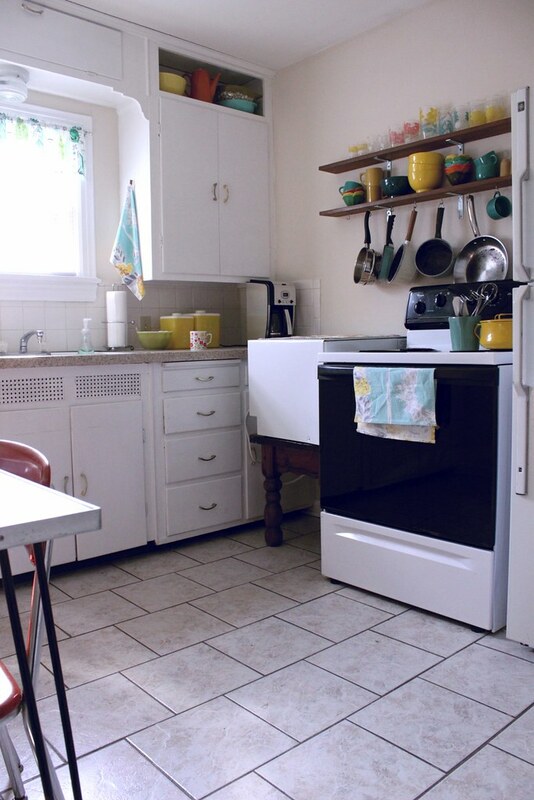 It's an easy way to repurpose and add something unique to a vintage kitchen. Below is what our fridge looks like at the moment. Along with a handful of coupons that are out of sight! The aqua magnet was a gift from my mom from a shop in OKC and the California card was in a gift from Rubyellen. I'll always be a California girl! 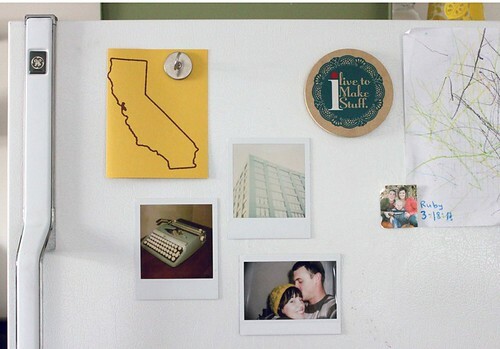 I turned the Polaroids and Instax into magnets by adding sticky magnet paper to the backs. The small ones are from when Sebastian was Ruby's age. Also, that's Ruby's first real coloring project. A lot of her work ends up on our walls these days so we're working hard at redirecting her to paper. This next room is what I call our 'middle room'. It's about 8' x 8' and has one or two entries or doors on each side. The above photo shows a linen closet to the left and our only bathroom to the right. This is the little corner between our bathroom and bedroom. The shelving unit was originally built to be a bench for the kids' room but it got set here on move in day and I loved it. It's a good place to display parts of my typewriter and thermos collections. Every now and then I'll hear little fingers tap-tapping on the keys of the bottom two. The art work shown above the shelving unit are both by AshleyG. The typewriter print is from LifeLovePaper. It's actually a photo of the Olivetti typewriter I sold to her through my vintage Etsy shop, PonyParty! And that chair...oh, I love that little chair. I've mentioned before that I had it on my lap in the car as we moved halfway across the country. This corner is opposite the last corner on the other side of our bedroom door. That mirror was a lucky Craigslist find from a local warehouse. The table, tray, lotus bowl, and little tray were all thrifted. The artwork is again, Ashley G. I spray painted the bronze lamp in a nice shade of blue and bought a new shade at Target. This is our catch all and it no longer looks this neat. It only took two hours. And the bedroom, well...that'll have to wait for another day. You can see our living room here and the kids' room here. Thanks so much for your sweet comments on our space so far! Your home is beautiful! It is more than obvious that a happy and loving family lives within those walls. Your kitchen is just how I want mine to be someday. Clean, bright, and functional. I can't wait to see more! I love Ballard! Thats where my friends and I lived during college! Your house looks amazing and I love the vintage pieces. I'm slowly putting together my first place and it's a great feeling when you find a great deal on a vintage piece :) Thanks for sharing your spaces it's very inspirational. 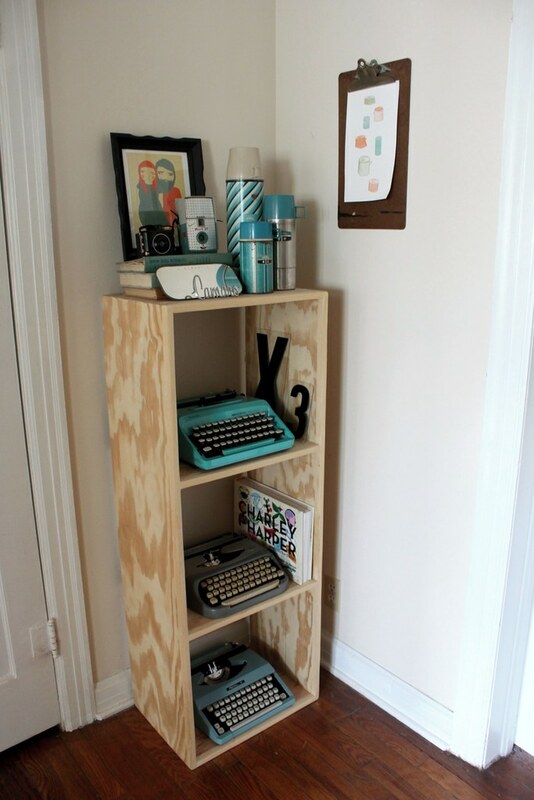 Oh my gosh I love that typewriter bookcase! I wish I had a spare corner to build one for my 5 typewritesr. What a happy moving surprise! pretty!!! pretty!!! jealous of the white cabinets, hairpin table for ($15), and typewriter collection! oh to find a turquoise one for myself one day would be a dream!!!! all i need is one! ha! p.s. i don't think revealing your secret is mean! i wouldn't do it either! I love you style! I really adore have you've made your home so bright, cheery and colorful without painting the walls. Job well done. I saw some canisters today at a thrift shop that reminded me of you. They were white and had mushrooms on them. Totally looked like something you would have in your kitchen. I wish they matched our decor but I know my husband wouldn't have liked them. Oh well! I love your kitchen.. I might have to borrow the idea of hanging shelves for more space. We just moved into a place with a much smaller kitchen than we had and I have no idea where to put everything! I have been absolutely drooling over that piece from Funtiques since I first saw it there.. so jealous that you snatched it up! so lovely! I like that you have a reoccuring color palette throughout. And by the peek of your bedroom, I can't wait to see it! I so wish that poster was still for sale. ARG. I love all of the blues, greens, and yellows. So peaceful yet happy! I also love that you are keeping the secret of your table find. There's just some things you can't share! What a beautiful home you have! I love its brightness! Well, lady. I'm sending you a fun package soon. I think it's only fair to share some of Springfield's little treasures with your neck of the woods! 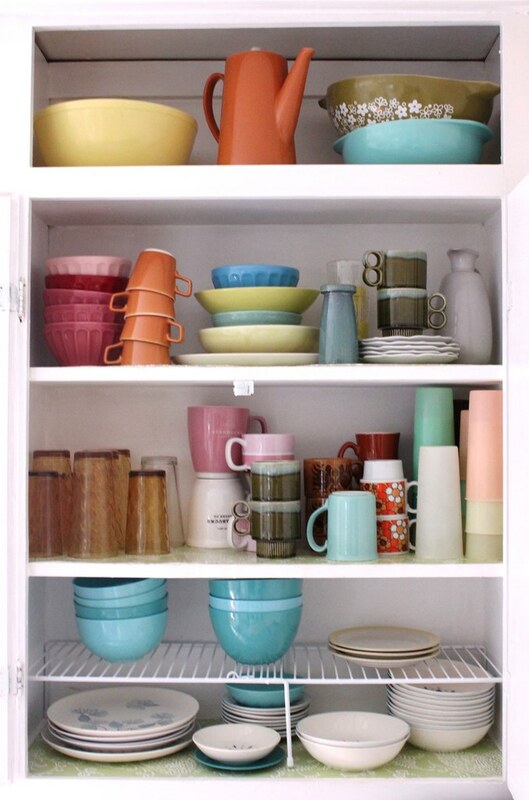 I love your cozy kitchen and the wonderful colors!!! I didn't get the one from Funtiques but I think it is gone. Elsie found this one for about $5! The $60 price tag on the other one just wasn't quite low enough and now I'm so glad I didn't buy it. It IS still for sale and in a few other colors. I'll share it in the bedroom post as I'm not exactly remembering where it is right now. Thanks, everyone for the sweet comments! Your place is so cozy and fun! Loved your article in Artful Blogging magazine..you were one of my favorites. you have decorated your place so adorably. 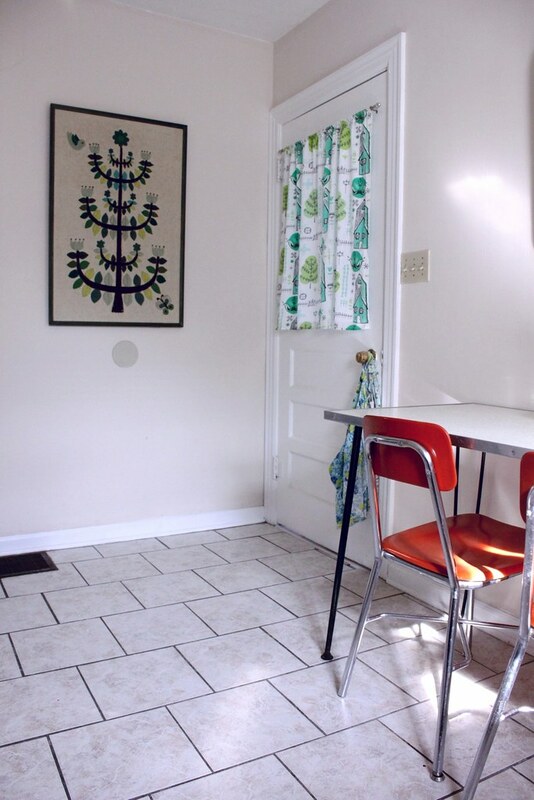 I love all the Pyrex pieces and that embroidery on the wall!! Your home is beautiful, fun, and sunshiney. I love it! Can't wait to see more. so lovely, i just love it. i can't wait to be settled so i can decorate our space with some inspiration from yours. oh my goodness Rachel! This is a amazing! You have a knack for collecting the greatest stuff and the way you show it off in your house is tre cool. LOVE it. Your home is all eye candy. You have the sweetest home! I love all of the little, homey touches. living in swizzie-land i had to google the "alpine swiss plate" you were talking about. they are from marcrest, right? can't wait for the bedroom. thanks for sharing. What a lovely home! 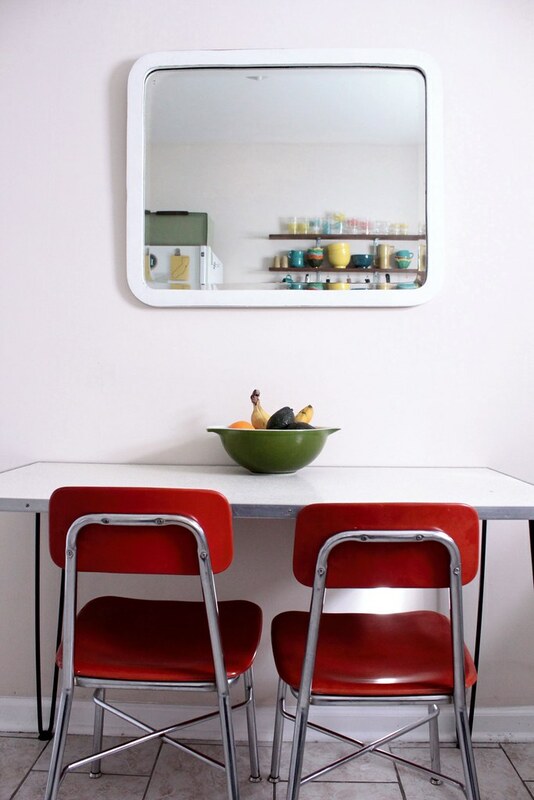 I especially like the mirror in the kitchen - I love rounded white frames. LOVE the colour pallete and little details! 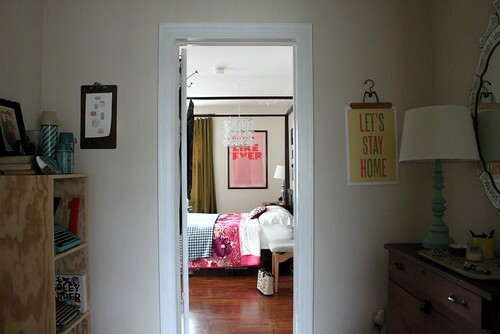 I love the typewriter/thermos shelving and the 'Lets stay home' with the painted lamp. oh I love home tours! I love your kitchen cabinets. I know that sounds weird, but my cabinets are brown and I haven't been up to the task of painting them, soooo I'm a wee bit jealous of all that bright white! It goes fabulously with your pyrex! As a homemaker with only 3 years experience I find your home truly inspiring. I tend to lean toward the blues, greens, and yellows with a touch of grey and red as well but I'm always afraid of overdoing it. Your home is proof that it can't be done. It looks amazing and even more "put together". Thanks so much for sharing! so gorgeous!! I just totally got some inspiration for our new apartment. Your kitchen is really lovely! 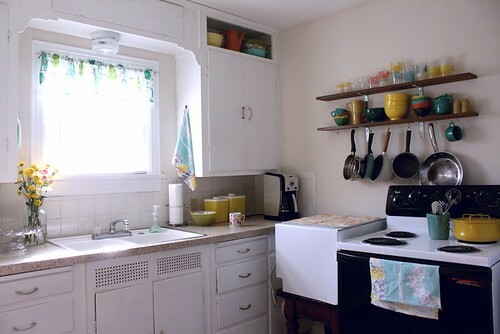 I would normally balk at the very idea of an all-white kitchen, but seeing how well your colourful plates and fabrics brighten it up, I have been converted! I want your dishes. bad. Love it! Did you paint the walls too? If so, what is the color? 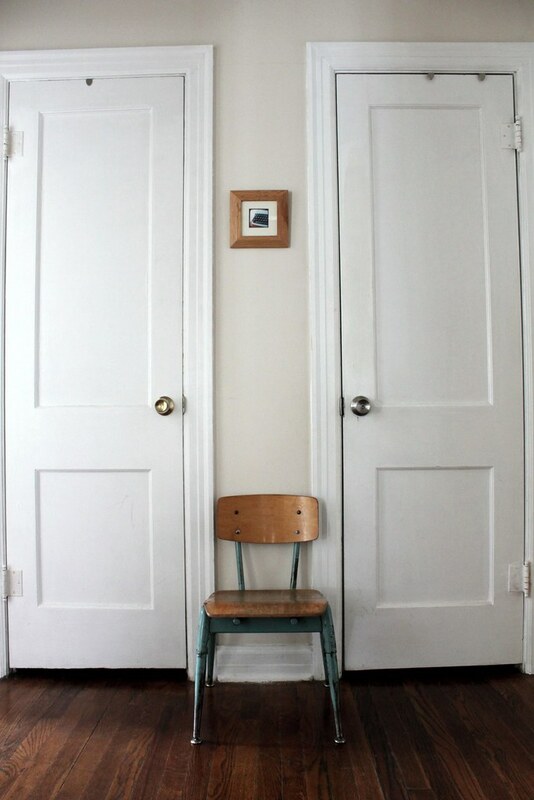 We are debating on paint colors right now and yours looks like a perfect neutral. just perfect.. simple and pretty! They are a warm cream but it's a rental so it came this way. Not sure the exact paint name. 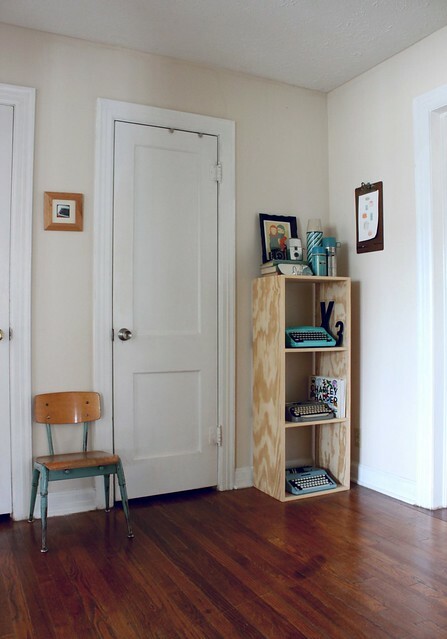 I love how colorful and fun your home is despite the white walls. It is such an inspiration for me! Everything is so bright and colorful!! I love it! 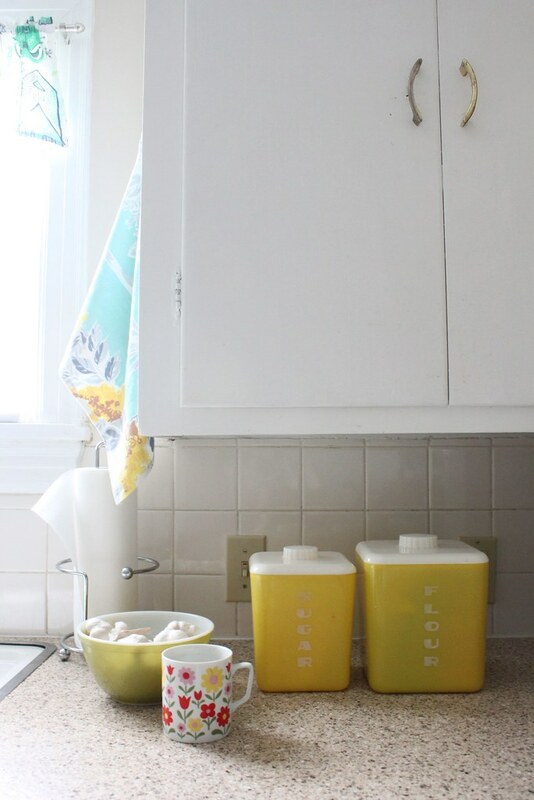 The color scheme in your kitchen is so cheery :) I'm excited for the rest! Wait, hold up! You live in Seattle? What a pleasant surprise, I live on Whidbey Island :) Your kitchen is darling! 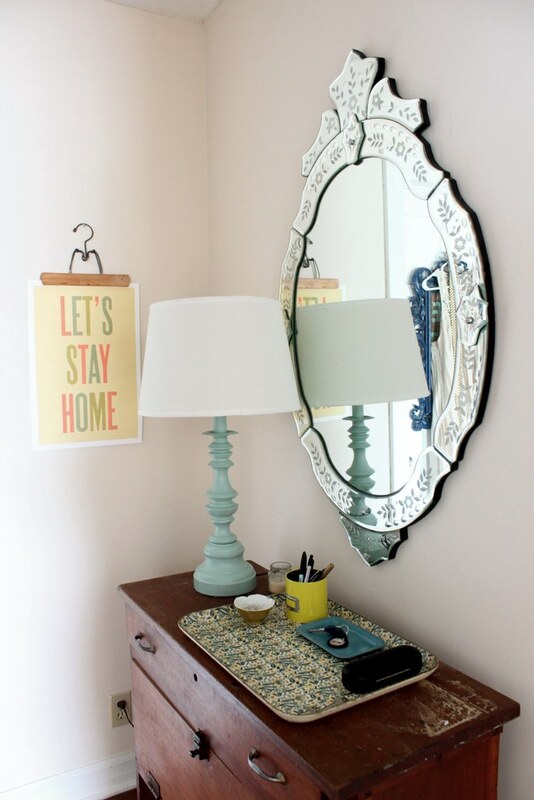 Love the home tour series and your great vintage style! Hey, I live in Ballard too and I love it here as well! Your little curtain on the kitchen door is great! I love the pattern. And thanks for the sticky magnet paper idea!! Everything looks beautiful. You've really made all the different shapes, colors and sizes of your vintage pieces go together beautifully. I am in love with your house! You're an inspiration to me, because we're long-term renters as well. It's good to know that you can make your home your 'own' without some of the more permanent things that owners can do. your home is just darling. can you please come style my entire house?! please and thank you. OK I am completely in love with you house!! everything looks so lovely! i love your attention to detail. definitely doing to borrow your polaroid idea, so cute! and your bedroom looks amazing... can't wait to see more of it! so many cute dishes! and i love that mirror in your kitchen. You're house is so cool! I want to live there!! what a great space! looks like you have such a special collection and such a warm home!